Last weekend was such a tease, wasn't it? Beautiful sunshine and warm breezes, only to have cold winds and snow a couple days later. But hey— let's just put that aside and reminisce about the wonderful weekend that was. And it really was. 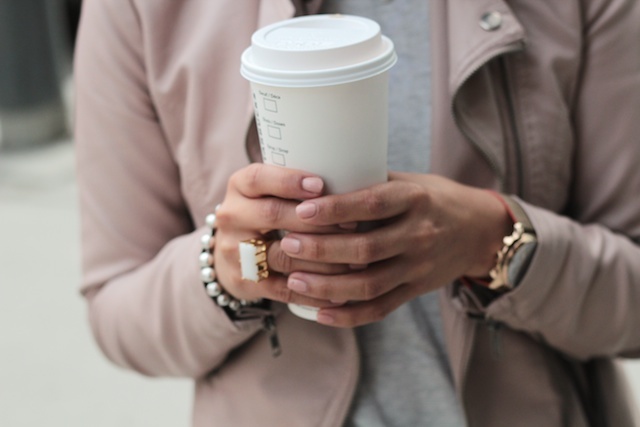 For me, it was a great weekend of shopping and brunch. This outfit is what I wore to the latter. With that, I am adding distressed denim and Sperry boat shoes to my list of obsessions for the spring / summer season to come. The jeans are from Gap (link here). On top of being the perfect length for me (I bought the "short / petite" version), they are comfortable to wear and easily pair with half my wardrobe (although, that may not be saying much because my wardrobe does consist of white / grey tops galore). Still, I adore them. Plus, the light denim wash is very spring-like to me. I decided to expand my Top-Sider collection with some new new Sperry's. I love the look of classic boat shoes in the summer, don't you? You can dress them up with flowy skirts and delicate dresses, or down with ripped jeans and patterned shorts. My new pair are a bit different than the pair I bought a couple summers ago. They're a similar style, except the new pair is all leather. They're incredibly comfy and great for walking around (i.e., shopping). Top, Target | Jeans, Gap (here) | Jacket, Forever21 (old) | Shoes, Sperry Top Sider (here) | Bag, LV Neverfull MM (here) | Ring, Dean Davidson (here) | Watch, Citizen (here) | Nails, Essie "Spin the Bottle"
Speaking of shopping— does my hair look more volumized in this post? I hope so because I picked up some new hair products on the weekend. My hair is in dire need of some volume and texture. I have a lot of hair... but it's very fine and it's also straight. That combination is just asking for dull, flat hair. So, I took advantage (maybe a little too much) of the Sephora VIB sale and one of the things I picked up was the Living Proof Amp Instant Texture Volumizer. Doesn't that just sound like the bomb-dot-com? I've tried a few products from the brand that I've liked, so I figured this would be no exception, and it wasn't. It has a gel-like consistency that I was a little wary of at first. I was afraid that it would leave my hair feeling crunchy, but it hasn't. The trick is to take a small dollop of product and rub between your hand until it becomes transparent before scrunching it into the layers of your hair (carefully avoiding the scalp). It added a noticeable lift to my hair and that's all I can ask for. 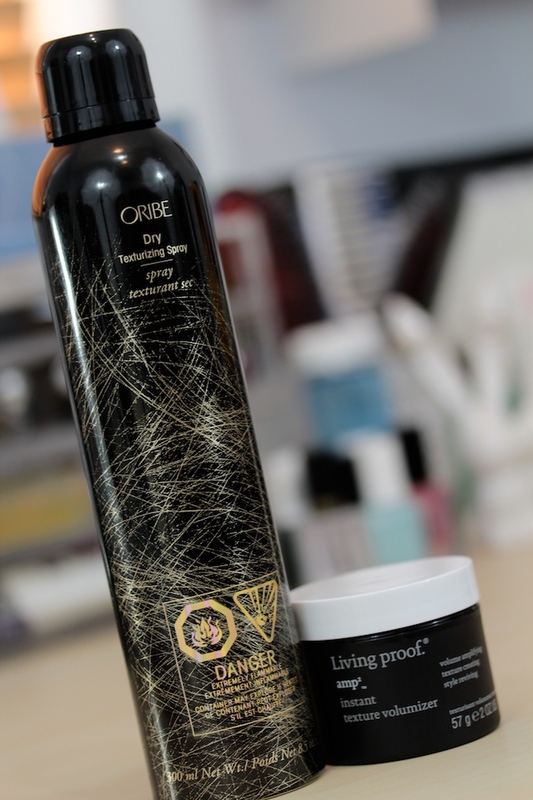 The other product I picked up was the coveted Oribe Dry Texturizing Spray. My oh my, this cost a pretty penny. It's priced at $44—I think that's the most I ever spent on a single hair product. And alas, I do love it. First of all, it smells great (very handy for those second day hair moments). Secondly, it works. The spray is so lightweight that it doesn't weigh down your hair or make it feel crunchy (or worse, greasy). Yet, it gives your hair texture and a bit of volume. Yes, please. It's a combination that works because both products are lightweight and easy to layer without leaving my hair feeling gunky. Yup, I'm in love. BTW: if you're wondering where I found Oribe products— I bought mine at the Holt Renfrew on Bloor. I'm sure that Oribe products are available in salons and speciality boutiques across Toronto, but Holt's was the easiest to locate. If you're planning on checking it out, they're displayed on a shelf between the Laura Mercier & NARS counter. Have a great Easter weekend, loves! Love your outfit! I seriously can't believe this weather either (fellow Canadian here)! This weekend I packed up all of my winter stuff and threw it into storage. I think I jinxed it! Haha! P.S. your hair looks gorg! I'm about to move to Toronto (this weekend, eeee! ), so really excited about your new series! Also, you look great! *gasp! * You dropped the money for that Oribe huh? I had been lusting for it for ages but couldn't find anywhere that sold it. Wandering into a tiny beauty shop on day in a hip part of town and almost had a mini heart attack seeing the price tag. I've also been eyeing the Bumble and Bumble Cityswept spray which is a bit cheaper but looked amazing in a demo. Love your jeans! I have a similar slightly darker pair from Zara , ankle skinny, which I love!